User interfaces in cars have become increasingly complex. The trend is to offer more physical and digital interfaces, in spite of the safety hazard they pose. These interfaces are not currently designed to be easy to use or intuitive. As we move toward a world where self-driving cars are the norm, and shared cars take the place of car ownership, simplicity and ease-of-use in car systems becomes increasingly important. We wanted to explore this topic space because there are shifts in the industry that affect a user’s car technology experience, and there is a lot of work that remains to figure out what this experience should be like, while maintaining safety as a top priority. Our process started with primary and secondary research to help define a need that’s worth tackling within this broad topic space. We asked car owners about why and how they drive, and asked people who don’t own cars about their experience as a passenger, or borrowing or renting cars. Three insights came out of our research that drove our design. How can we give drivers and passengers access to easy and simple car customization, either in their own car or a shared car? Mark is composed of a mobile application and an in-car console system. The two parts work together to create a seamless and customized experience regardless of which car you are using, or who used it before you. Visit our project page for more details about Mark's features. This diagram illustrates the converging and diverging of our design process during the 2.5 month project. Value web: One of our first activities as a team was to document a value web surrounding car owners. This helped us think more expansively about opportunity areas, and informed the key questions for our primary research. User research: I helped develop our research protocol and conduct 9 interviews with both car owners and non-owners. The owner interviews were done in a Zipcar to provide context and a point of comparison for participants to talk about their experience in their own cars. Concept storyboards: Our research findings led us to 6 product or service opportunities. I helped sketch short storyboards to clarify the concepts for ourselves, and communicate the ideas to advisors. They worked with us to evaluate the solutions using a framework based on viability, desirability, feasibility, and other unique project factors. 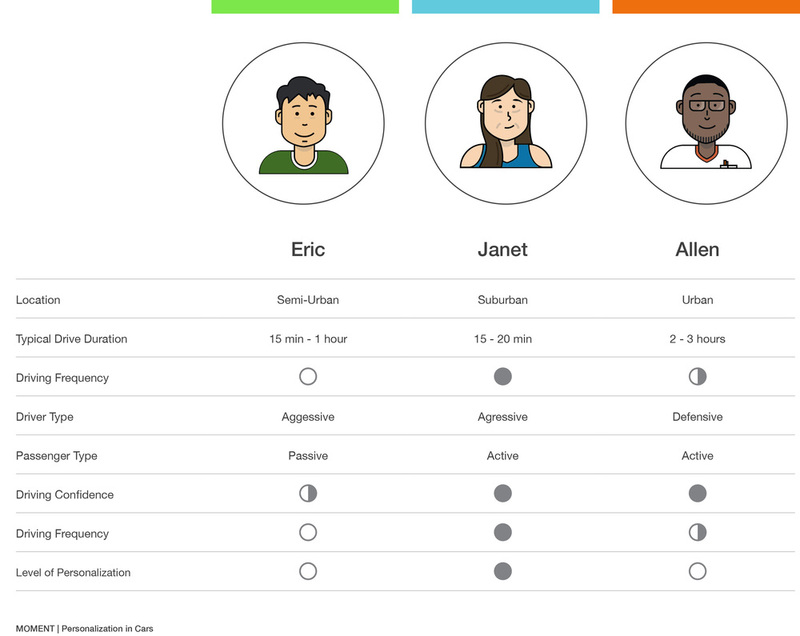 Personas and features: Once we settled on the Mark concept, we developed 3 distinct personas from the individuals we interviewed. Using these personas for inspiration, we brainstormed possible features for Mark using a mad-lib style worksheet. Sketching workshop: I helped facilitate two workshops during this project to get the whole Moment office involved in idea generation and design. 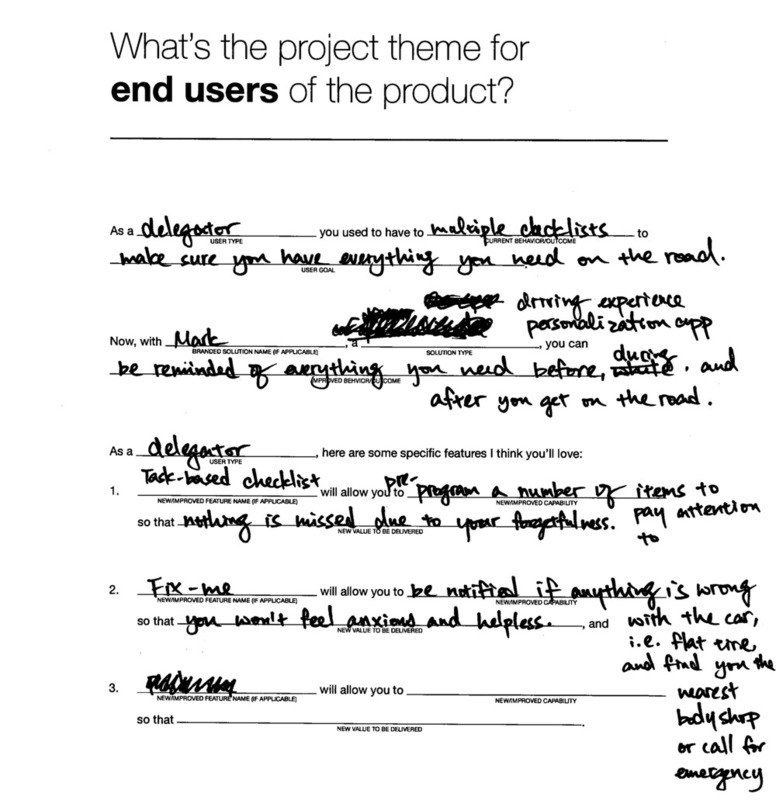 For one of them, we created stories in which the personas interact with Mark, and asked the designers to sketch what the user experience might look like for various product features that the personas encountered. Video: I crafted a storyboard and script, and created a video (above) that showed how our product could create a delightful experience for the user.